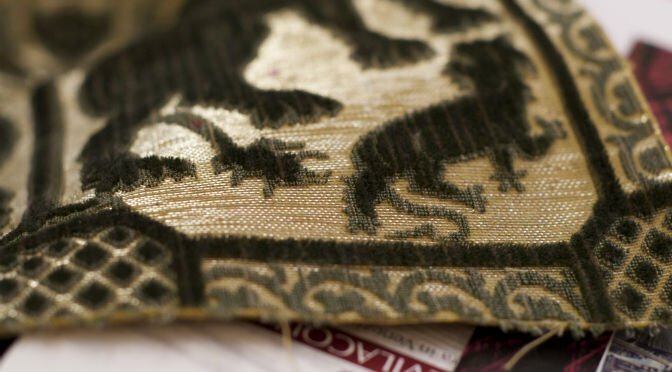 Behind Bevilacqua’s velvets lays a story of handicraft and patience, handed down from generation to generation, and which still comes true, just as it did in the 18th century. Like Penelope’s shroud, this work does make progress, but slowly. With respect to the queen of Ithaca’s work, though, velvets are a whole different ball of wax. Why? Well, because, at some point, they are finished. This story is about the probably most meaningful velvet for Bevilacqua’s: the Leoni Persiani soprarizzo velvet. 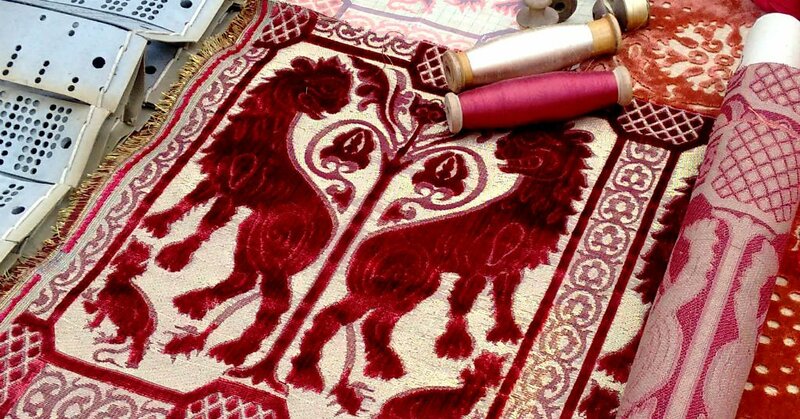 Since 2005, indeed, the Persian Lions of its pattern are part of the weaving mill’s logo. As all the other fabrics woven at Bevilacqua’s, this velvet is born from the silk threads on the 400 reels of the loom employed to produce it. From the reels, the threads run through the cardboards hanging over the machine: almost as if they were artists, the cardboards are what gives shape to the motif. Each hole on them, indeed, corresponds to a thread: all of this warp must then be handled by a weaver. After all, we’re talking about handwoven velvets, aren’t we? A detail of the Leoni Persiani velvet. Under the warp of threads woven by the loom, the weaver slips some thin needles, which will be removed later. These are not identical to one another: the minority of them will be used to get the velvet effect; the majority of them, on the other hand, are characterised by grooves. These are the secret to creating the curly effect, and the velvet is just above it: that’s where the name soprarizzo (“over-the-curls”) comes from. The cut velvet and the curly velvet can be distinguished from each other thanks to their colour, as well: the former is darker, the latter is lighter. But why is the former called cut velvet? Because of the technique employed to produce it: by sliding a blade over the threads of the weft, the weaver cuts them and creates the velvet effect. Weavers must therefore be extremely careful, in order to remove the right needle: at least 4 of them must be placed in the warp, so that cut threads may not fray. The same attention, though, must be paid to the loom: since it dates back to the 18th century, it isn’t as fast as modern looms. In short, it’s all but a non-stop machine, since it must be often recharged and reset: no wonder that the best it can achieve in one day is a 30-cm-longer fabric than the day before. But, even if it is slow work, the fruit of craft traditions is always unique. Enough to make Penelope green with envy.